The RM-B170 remote control unit is the successor to the RM-B150. It provides an even more affordable solution for basic remote camera operations, with added features, including the remote control of media and the operation of clips of non-linear media. 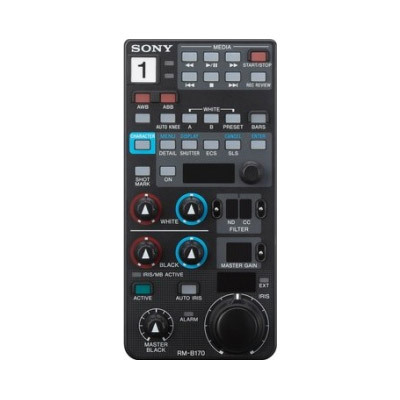 It can be directly connected to a camera or camcorder as a portable-type remote control unit or it can be connected to a CCU for use as a simple remote control panel. The RM-B170 can control a camera from a distance of up to 100m (328 feet) when connected directly to the camera. 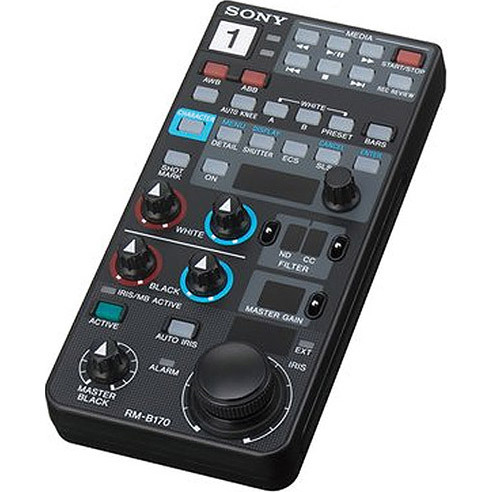 As well as camera painting adjustment, the unit can control media inserted in the recorder connected to camera or a camcorder. It also supports the operation of clips of non-linear media. The unit is supplied with an 10m interconnect 8 pin remote cable, which provides an analoguecomposite output for a picture monitor for all camcorder series (Down-converter must be enabled on HD models) . Alternate Cables: CCA-5-3, CCA5-10, CCA5-30 series of cables can be used for ‘control only’ (without picture monitoring function). 50 meter and 100 meter interconnect remote cables are available via special order. The RM- B170 uses the new studio camera command system and may be used in applications or in place of RCP-700 series remote control panels. The RM-B170 can perform automatic black/white adjustment of the camera. The Extended Clear Scan (ECS) and electronic shutter functions of the camera can be turned on and off from the unit. It is also possible to adjust the ECS frequency and shutter speed. The RM - B170 can set the number of accumulated frames for a camera equipped with the SLS (Slow Shutter) function. *Some CCU model doesn’t support multiple control. Various functions can be assigned to two buttons, which allows journalists live logging (shot markers) or camera function activation. The operations buttons and controls on the front panel of the unit include buttons with Superluminosity LEDs, making them easy to identify in a low and high light environment and indicating the operation status by flashing or lighting. The brightness of the indicators can be adjusted. A guard is in place around the buttons where operation by mistake might seriously affect camera operation or setups. External GPI Input/output (D Sub 9 pin connector) support Red and Green Tally outputs, a 12V DC input and a spare input for future use.